People have no end of options when it comes to dry cleaning. While several businesses offer similar services to Comet Cleaners, none will have our impressive record of achievement. With over 60 years under our belt, and the innovations we have pioneered in dry cleaning, our competition are now using methods that would not exist without our contributions. We are leaders in this industry. We’re confident customers will notice the difference between us and them. We continuously improve our services to be more convenient and of higher quality than washing your clothes at home. We are determined to make your life easier. Comet Cleaners was the first to open a 1-hour dry cleaning service in the United States. Clothing has changed quite a bit since those days, making 1-hour services impossible on some jobs. Nonetheless, we have upheld our commitment to speedy service by offering same day services for cleaning dropped off before 9am (or later, pending location). If you have any questions about our services, you can call us or check out our frequently asked questions section. Our 60+ years of experience has taught us a lot about what customers expect from a professional dry cleaning service. More than anything else, people want it to be convenient. After all, if taking it to a professional service is a hassle, why bother? We never want our customers to ask themselves that question, so we have implemented numerous features into our business model that makes dropping your clothes off at the cleaner’s simple and easy. Same day services: At all locations, if you drop your laundry off before 9 you can pick it up that same day. Certain locations can even get the job finished if you visit before noon. 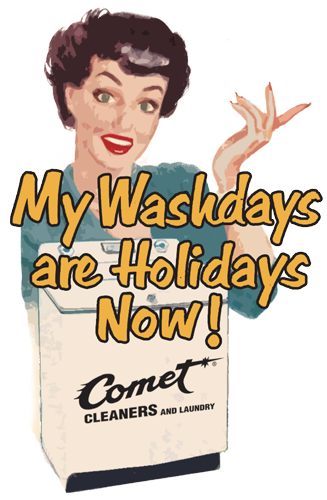 Drive up service: Many Comet Cleaners locations have drive thrus, allowing you to drop off laundry without ever leaving the car. Some facilities that do not have drive thrus offer car hop services. Simply park your car in a designated spot and our staff will come to you. 24 Hour drop offs (at many locations): many of our facilities offer a convenient drop off box where you leave your laundry anytime, day or night. Perfect for those who cannot make time during regular business hours. Express Bag Service: We give customers free, personalized express bags that make it easy to gather your clothes in one place. These bags easily fit in our drop off boxes and car windows. Saturday service: When the week is too hectic, come in on Saturday to have your dry cleaning needs taken care of. Our founder entered the dry cleaning industry when it emerged in American society. Our company spearheaded advancements in dry cleaning, and in many cases, we helped to steer the industry in new directions. Today, we reap the benefits of our experience by utilizing state of the art technology and cleaning methods that have proven themselves the best in the business. The clothes you wear impact the first impression you make on everyone you meet. 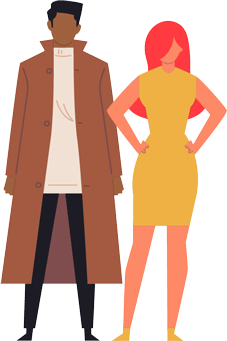 Whether you’re wheeling and dealing in the corporate world, or making your way as an artist, have your clothes make the statement you want them to. We want to help you succeed, and are happy to play a part by providing you with clean, pressed outfits that fit your style. The effort we put into laundering your clothes is matched only by the quality of our customer service. Our staff is always happy to help you with any of your dry cleaning needs. The way we see it, you are doing us a service by helping our company grow with your business. The least we can do is make your experience with us a spectacular one. The little annoyances in life can stack up and eat up a lot of our day. You will be surprised about how much extra time you will have just by letting an expert take care of your clothing. If you’re skeptical, start small. After you experience how amazing your clothes smell and feel after our service, we’re confident you’ll be back for more.